When running network patch cable through a home, it’s more cost-effective to use bulk cable and terminate the ends by yourselves. Because this offers users the flexibility to cut out a required length, whether very short or very long. On the other hand, if one needs to route 50ft Ethernet cable upstairs through a closet ceiling, it’s much easier to run a copper cable without the heads attached, and crimp the ends immediately when it’s in place. Thus, it’s necessary to take a few minutes to learn Ethernet cable crimping. Here uses RJ45 Cat5e cable as an example to show the cable crimping steps. Figure 1: Tools of crimping Cat5e cable. A length of uncrimped, unshielded Cat5e bulk cable. You can buy it in bulk online, or if there are some Cat5e network cables with damaged connectors on hand, snip them off and start anew. 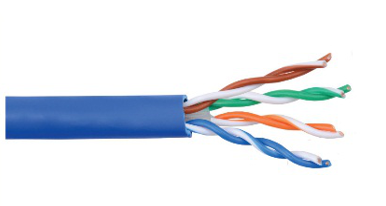 Cat5e color comes in a wide range, the most commonly used is blue. Choose one color you like. Cat5e RJ45 UTP modular plugs. They are the plugs at the two ends of a Cat5e cable. Then confirm the wire channels of the connectors can be coupled with the Cat5e cable’s outside diameter (24AWG-0.95mm, 26AWG-0.9mm, 28AWG-0.75mm ). A stripper tool and a crimping tool. Stripper tool is used to strip the sheath of Ethernet cable, and crimping tool is for affixing an RJ45 modular plug to the end of a copper patch cable. 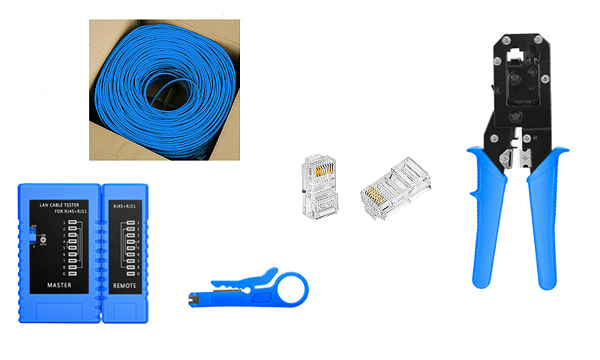 In addition, you may prepare a cable tester to test whether the Cat5e cable works properly after crimping both ends. The following are the steps of crimping Cat5e cable. Step One: Cut the Cat5e patch cable to the required length. And use the stripper tool to strip about 2.5cm of the jacket at the two ends of Rj45 Cat5e cable. Figure 2: Striping the cable. Step Two: When the jacket stripped, there will be four twisted pairs of wires exposed. Each pair is represented by a solid color and a striped color, including orange-white striped and solid orange, green-white striped and solid green, blue-white striped and solid blue, brown-white strip and solid brown. Separate these pairs. Figure 3: Four twisted pairs. Step Three: Choose on wiring standard. T568A and T568B are the two color codes for wiring 8-position modular plug. As the following figure shows, the only difference between the two color codes is that the orange and green pairs are interchanged. There’s no difference in connectivity between the two standards that a T568B patch cable can work fine on a T568A cabling system, and visa-versa. Usually, T568B wiring standard is regarded as the preferred wiring pattern. Here we use T568B standard. After separating the four pairs, now there’re 8 individual wires. 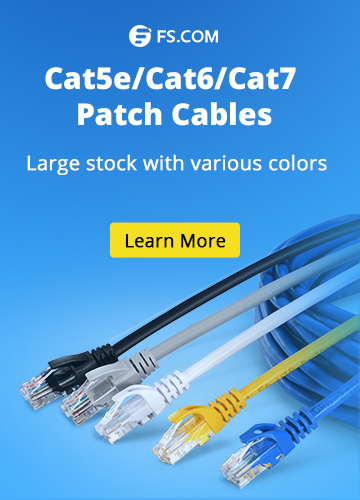 Arrange the Cat5e cable order, making the 8 wires in T568B color sequence. Step Four: Pinch the 8 wires between fingers and cut off the wires to keep them neat and aligned. 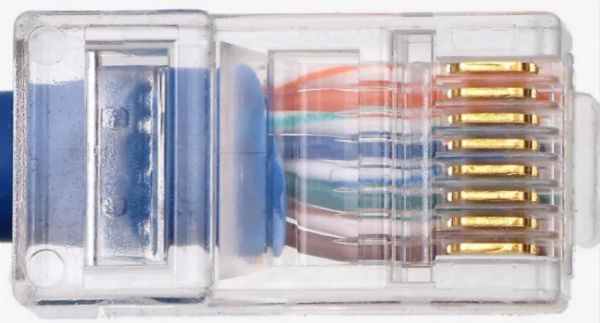 Note that, the insulation on the Cat5e cable should be just inside the bottom of the Cat5e RJ45 connector. The wires should be cut off so that they can line up evenly with the top of the RJ45 connector. Step Five: Plug the wires into the RJ45 connector, making sure each wire goes all the way to the top of the RJ45 connector. Otherwise, the newly crimped RJ45 connector may be invalid. Step Six: Use the crimping tool to crimp the newly produced RJ45 connector and press hard, making sure the contacts of the connector entirely connected with the 8 wires. Then, one end RJ45 connector of Cat5e cable is achieved. Repeat step one to step six on the other end of the Cat5e patch cable. But note that, when doing Cat5e crimping, there’re two kinds of Ethernet cables can be made, straight through and crossover. For the straight through type, just use the same wiring standards on both ends of the cable. It’s often called “patch cable”, designed for almost all purposes like connecting the computers to routers. For a crossover type, use T568A on one end and T568B on the other end. The purpose of this cable type is to connect one computer to another without using a router, switch or hub. Figure 5: RJ45 Cat5e cable crimping is completed. Last Step: Use a cable tester to test the crimped Cat5e cable, guaranteeing it can work fine. Crimping RJ45 Cat5e cable is not much difficult. Just prepare the stripping and crimping tools, and follow the above steps, you can make it. However, to successfully complete this job, it’s better to use cables and tools with good quality. 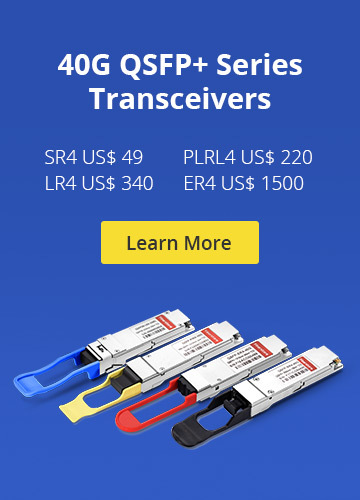 At FS, you will find the highest quality Ethernet cables and tool assembly for the most critical networks. All the RJ45 Ca5e/Cat6/Cat6a/Cat7/Cat8 cables have fully passed the Fluke Channel Test, delivering excellent performance. They adopt PVC CM jacket design, which provide better fire rating than PVC jacket. Plus, FS copper patch cables apply oxygen-free copper for high electrical conductivity and low signal transmission attenuation. FS also provides a set of copper assembly like stripping knife tool, punch down tool, and network installation tool kit. These tools are with the highest quality control. If you still have some questions about network cable crimping, sales at FS are always happy to help via us@fs.com. Copper Network cat5e, Cat5e crimping, cat5e patch cable, Ethernet cable, network cable, RJ45 Cat5e. permalink.